There are points in your life when you look at where you are, what you are doing and think "where the heck did this come from?!" At least there are in mine. It happened this past weekend when I baked with duck eggs. If you follow my blog, you know we are doing the Whole 30 diet. And when I say "doing it" what I really mean is doing it about half the time, using it as a suggestive guide and still making good choices when we cheat. Notice I didn't say if, at this point, it's just when. The cheating is inevitable. But we are still sticking to a predominantly Paleo diet. One of the main tenents of Paleo is eating the best foods, including local, cage free eggs. I can honestly say that before about a year ago, I thought the clean eaters were crazy. My best friend did it and I thought she was a little nutty (sorry, Katie) and then I'd read all these people that were going gluten free and thought, "ya'll are nuts." But here I am. That person. That person that has at least 6 types of flour in her pantry, buys out half the produce section when doing grocery shopping and now spends $5 on a dozen eggs because I really can tell a difference between the cage free organic and the cheap store eggs. And now I have friends that are crazy chicken ladies! And sometimes I get my eggs from them! Last week, my co-worker brought in duck eggs and asked if I'd like to try them. We go through a ridiculous amount of eggs, so I said sure! Let's do it! I took a half dozen eggs from her. She told me that she mixes them in with her regular eggs when making scrambled eggs, because they do taste a little different, and that she loves to bake with them. 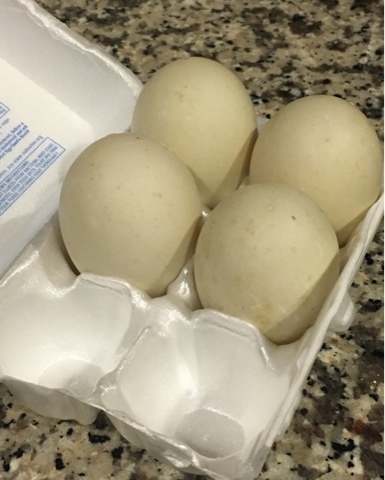 So this past weekend, I used my duck eggs! I made scrambled cheesy eggs with them Sunday morning. Cheese is not Paleo and not Whole 30, but, it's cheese, so I did it. I did half regular eggs and half duck eggs. I also used ghee, which I haven't quite determined if I like it or not. The eggs were good, but definitely tasted different. I honestly couldn't tell, though, if it was the duck eggs or the ghee. I'm suspecting it was the ghee. 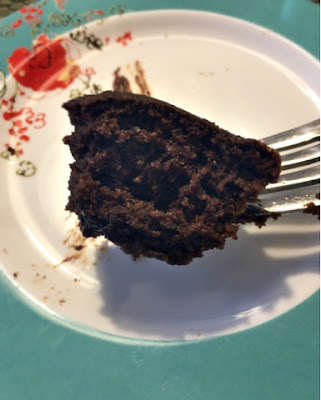 Monday, though, I made my favorite Dirty Chocolate Chai Muffins with the duck eggs. Yes. Give me all the duck eggs! Duck eggs are bigger than chicken eggs. 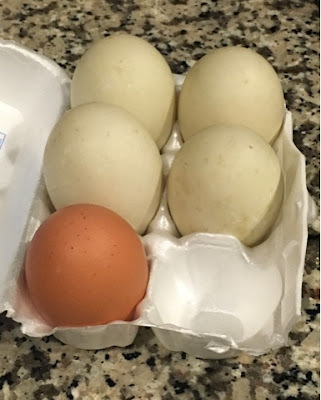 I put one of my regular eggs beside the duck eggs for reference. The egg on the bottom left is the chicken egg! The recipe called for 4 chicken eggs, so I used 3 duck eggs. I was hungry and didn't get a picture of the egg yolks before I whisked them, but I wish I had because they were so big! I definitely didn't need 4 of them! I made the recipe as usual, but with my duck eggs. I baked them for 25 minutes. When I went to test them, I noticed that the toothpick was mostly coming out clean, but not all the way. I suspect that was the chocolate chips in them! I put them back in for a minute before taking them out. So, the differences. 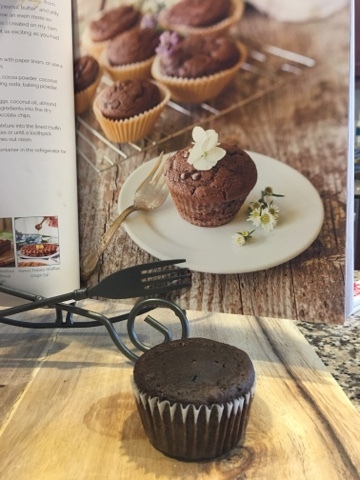 I noticed that these muffins rose a bit more than usual. The picture below is from the first time I made them (read about it here). They were pretty flat on the top. This picture is of the muffins from this batch. They definitely have more of a muffin top to them! I have noticed in gluten free baking that things don't rise like regular baking. They are still good, but gluten free muffins are usually denser and flatter. The muffins are also super fluffy! They taste more like a normal muffin or cake does. I tried to take a picture to show the consistency of the muffin. It's slightly hard to see because they are so dark! You can definitely see the air bubbles though! I actually really like the duck eggs. I don't know that I would scramble them very often, but I do love them for baking! 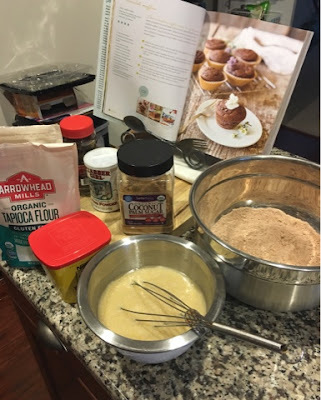 I have this one muffin recipe for Pumpkin Spiced Muffins. I love them, I do, but they are truly gluten free muffins. Our friend calls them the poop muffins because they look so ugly! I follow the recipe exactly and they never come out pretty, but they are so tasty! So I keep making them! I wonder what they would be like with duck eggs! I might have to save my last one for that recipe next week! Have you ever tried duck eggs? Do you have a crazy chicken lady friend?! They are the best! I've never tried duck eggs and to be honest, I've never even thought about using them. I have a few recipes like that....come out looking a little funk but that are amazing!! Those are usually the best ones. My favorite brunch spot in Durham serves fried duck egg sandwiches and my husband and I LOVE them! I haven't noticed whether they taste different from chicken eggs, which is kind of difficult with the sandwich because of all the other yummy toppings they put on it -- like bacon jam and pickled onions, yum! -- but even if they do, I like them! Those chai muffins also sound amazing... care to share the recipe? I love to bake so this is a great noteI I would have never thought to do this. I love duck eggs! Actually, I love all things duck. I keep thinking about raising chickens soon, but then I'm like, "But instead I could keep ducks!!" 1) They're cuter, 2) They're friendlier (omg youtube "pet duck" videos. Seriously. ), 3) their eggs are bigger (and I think they taste better). I'm glad to hear you liked them! Duck eggs are so interesting to me, but I don't know if I could eat them scrambled. I'd definitely try to test out how they bake though. Such an interesting read! Yummy! Your muffins look great! I've never cooked with duck eggs before. WOW! This is so cool. I have always wanted to try Duck Eggs but was worried I would waste my money. I have to agree about cage free eggs, they taste better! I went on the whole 30 and loved it but couldn't go past day 15. It did help me figure out if I don't feel great it was probably something I ate.